On April 11, 1937, twenty-one Slovak-Canadians in Creighton Mine, Ontario came together and founded a Group Term Life Benefit Plan to help members and their families during times of need. This was a very active group and by 1942, the members had also started branches for Slovak-Canadian women and youth in the area. In December 1946, members of this group, along with many other similar Slovak-Canadian organizations across Canada, voted for the creation of The Canadian Slovak Benefit Society (C.S.B.S.). This new organization was a merger of many of the independent benefit societies across Canada. By 1965, the C.S.B.S. had become the second largest Slovak society in Canada with 38 branches and 2,035 members. The Creighton Mine section of The Canadian Slovak Benefit Society of Canada became known as Branch 21. Fraternal benefit societies had been popular amongst Slovaks living and working in Canada since the late 19th Century. At that time, many men realized that neither the company they worked for nor the Canadian Government would compensate them for work time lost due to sickness, injury or death. Slovaks across Canada formed group benefit plans so that in the event of illness or death they and their family members could count on a form of insurance to keep them out of poverty. While the C.S.B.S.’s main function was to collect money from its members and disperse that money if needed, members also made sick-bed visits and sent flowers or wreaths to sick or grieving members. To decide how to spend the money raised within the branch, all members would vote on when and how to spend the money and who qualified to receive a share of the funds. Branch 21 also gave members of the Slovak community in Creighton Mine a place to come together, socialize and maintain their culture while living so far from Slovakia. After monthly meetings, many of the members would stay to discuss their families, politics, Slovakia’s history and their experiences living in Canada. Each year two or three members of Branch 21 were chosen to attend a C.S.B.S. convention, where they would meet fellow Slovaks from other parts of Canada which allowed them to maintain close ties on a national level. Branch 21, along with other C.S.B.S. branches in the Sudbury area, helped to run the Slovak National House on Alder Street where they would hold concerts and plays filled with traditional Slovak music and literature. Summer picnics, dances, Christmas card sales and New Year’s Eve and Mardi Gras parties also served to bring members of the Slovak community together while raising money for the society. On April 11, 1997 Branch 21 celebrated its 60th Anniversary. To commemorate this event, they donated a plaque to the Anderson Farm Museum in Lively, Ontario honouring the C.S.B.S. and each of the founding members. The Canadian Slovak Benefit Society was dissolved on September 18th, 2005 due to low membership. 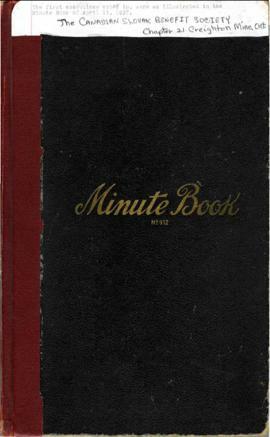 The minute book was donated to the Greater Sudbury Museum by the Canadian Slovak Benefit Society Branch 21 in 1997 and transferred to the City of Greater Sudbury Archives in 2011.